STORY: Locals and tourists flocked to Himalayan desert town of Leh in northern India to celebrate the colourful Buddhist festival, ‘Dosmochey’. The two day festival began on Sunday (February 03). 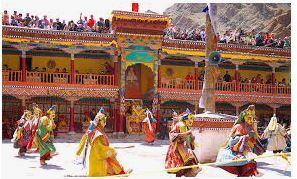 The annual festival is celebrated in February every year in the courtyard of Leh Palace to mark the damnation of evil. Monks of Takthok monastery prepare offerings to bind evil, hungry ghosts and protect humanity from natural disasters during the upcoming year. During the festival, monks also played music and performed the famous mask dance and other forms of traditional Tibetan art forms to celebrate. Tourists from across the world– from explorers and strollers to photographers– come here to explore the raw beauty of the Himalayan desert and witness the famous mask dance which is a key attraction of the festival. The festival is celebrated at the start of Tibetan New Year every February.